This cover by Roger de Valerio represents a caricature of the French singer, composer and lyricist Léonce Paco. He created some songs for the Montmartre cabaret ‘La Pie qui Chante’ but little else is known about his life. In the collection of the Bibliothèque Nationale de France, we found a picture of him being assisted by Georges Cochon and his fédération des locataires. Apparently Léonce Paco was having trouble with his landlord. 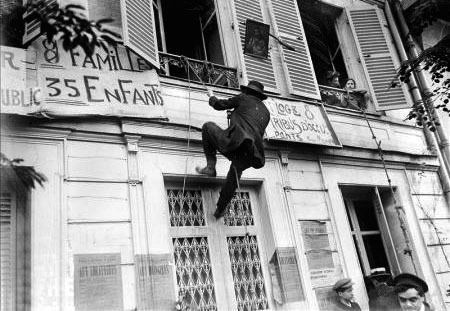 Georges Cochon was an anarchist and maybe the first squatter ever. He was very popular in the years before the First World War when cheap, decent lodgings were hard to find. 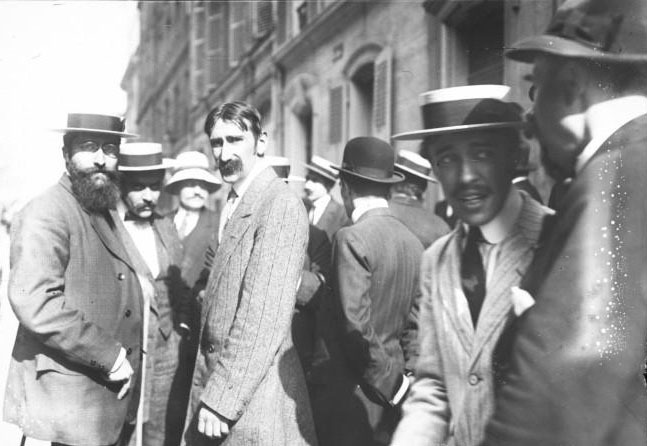 Georges Cochon founded a tenants union (Syndicat des Locataires) and was, like a kind of Robin Hood, always ready to assist people being evicted by their landlord. According to The New York Times he moved poor (large) families out of their lodgings on which the rent was overdue so quickly that the landlords couldn’t get papers executed to seize the furniture. He then moved them into any other place available. And if he couldn’t find lodgings, he created them in empty houses or buildings. Furthermore, to draw attention to his cause, he was the author of hundreds of playful protests. For example, he and his union erected a shack in the Parisian Jardin des Tuileries. On a banner one could read ‘House with garden donated by the Union of Tenants to a homeless family of 10, chased by their landlord and abandoned by the Public Assistance.’ Thanks to his protests public opinion changed and housing and renting conditions became more human. 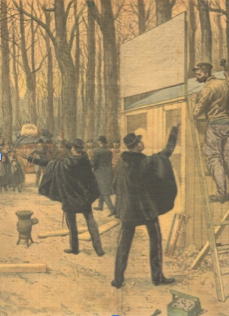 Georges Cochon’s Syndicate erecting a shack in the Jardin des Tuileries, being interrupted by the police. Georges Cochon was a welcome subject in the Parisian Cafés Chantants. 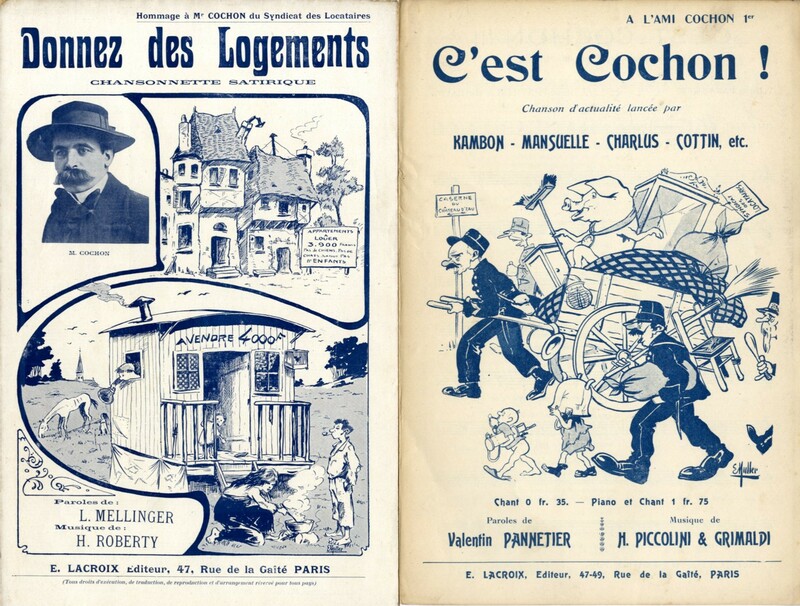 In our collection Images Musicales we have two songs sympathising with Georges Cochon: ‘Donnez des Logements’ and ‘C’est Cochon !’. The cover of the first song shows his picture and some cartoons of overprized poor lodgings. The cover of the second song illustrates his strategy to move the furniture of tenants with overdue rent on pushcarts, so that their furniture could not be confiscated. Both are illustrated by the same artist E. Muller. So far we have found no information about this illustrator. Previous PostLa Lionne de Mabille: trendsetter or courtisane?Next PostLaroche..? Oh yes!